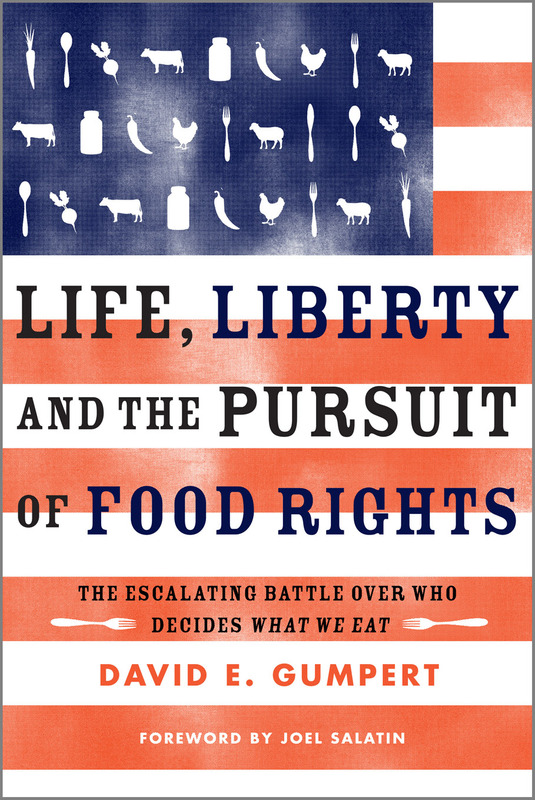 Title Life, liberty, and the pursuit of food rights : the escalating battle over who decides what we eat / David E. Gumpert ; foreword by Joel Salatin. Summary "Do Americans have the right to privately obtain the foods of our choice from farmers, neighbors, and local producers, in the same way our grandparents and great grandparents used to do?Yes, say a growing number of people increasingly afraid that the mass-produced food sold at supermarkets is excessively processed, tainted with antibiotic residues and hormones, and lacking in important nutrients. These people, a million or more, are seeking foods outside the regulatory system, like raw milk, custom-slaughtered beef, and pastured eggs from chickens raised without soy, purchased directly from private membership-only food clubs that contract with Amish and other farmers. Public-health and agriculture regulators, however, say no: Americans have no inherent right to eat what they want. In today's ever-more-dangerous food-safety environment, they argue, all food, no matter the source, must be closely regulated, and even barred, if it fails to meet certain standards. These regulators, headed up by the U.S. Food and Drug Administration, with help from state agriculture departments, police, and district-attorney detectives, are mounting intense and sophisticated investigative campaigns against farms and food clubs supplying privately exchanged food-even handcuffing and hauling off to jail, under threat of lengthy prison terms, those deemed in violation of food laws.Life, Liberty, and the Pursuit of Food Rights takes readers on a disturbing cross-country journey from Maine to California through a netherworld of Amish farmers paying big fees to questionable advisers to avoid the quagmire of America's legal system, secret food police lurking in vans at farmers markets, cultish activists preaching the benefits of pathogens, U.S. Justice Department lawyers clashing with local sheriffs, small Maine towns passing ordinances to ban regulation, and suburban moms worried enough about the dangers of supermarket food that they'll risk fines and jail to feed their children unprocessed, and unregulated, foods of their choosing.Out of the intensity of this unprecedented crackdown, and the creative and spirited opposition that is rising to meet it, a new rallying cry for food rights is emerging"-- Provided by publisher. Bibliography Includes bibliographical references (pages 238-251) and index. Contents A daughter's resolution -- Is there such a thing as private food? -- The hundred-year war against raw milk -- "We have just been...handed a fantastic case!" -- Local food and second chances -- The violent birth of the food rights movement -- Since when are we afraid of food? -- Food rights and the buzz saw of law enforcement -- The flickering promise of food sovereignty -- The search for a Rosa Parks moment. Subject Food industry and trade -- United States. Local foods -- United States. Farmers' markets -- United States. Food supply -- Government policy -- United States. Food -- Biotechnology -- Government policy -- United States.